Pope Francis greets students from Milan’s Istituto San Carlo during an audience at the Vatican on 6 April 2019. Photo: Vatican Media/CNS. 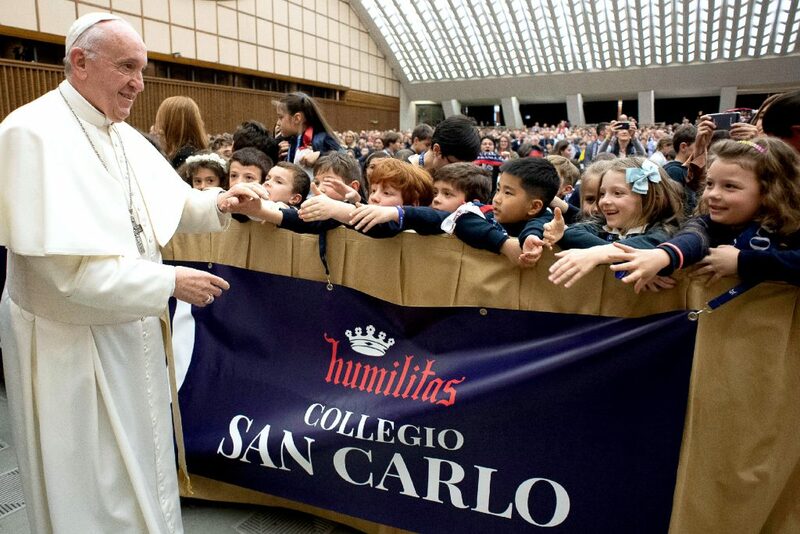 God does not play favourites, but human beings do in little ways at school and in big ways with the global economy, Pope Francis told students from Milan’s Istituto San Carlo, a school with students from prekindergarten through high school. Sometimes God playing favourites seems the only explanation for why some children have everything and some have nothing, the Holy Father said on 6 April. Asking “why” is essential for coming to the realisation that while human suffering is a mystery, often there is a human hand behind the pain. Meeting some 2600 students, teachers and parents from the Milan school, Pope Francis answered questions. Adriano Tibaldi, who is in his last year at the school, told the Supreme Pontiff that he and others spent a week in the summer working with very poor people in Peru and he asked the Pope: “Why does it seem that God shows favouritism?”. 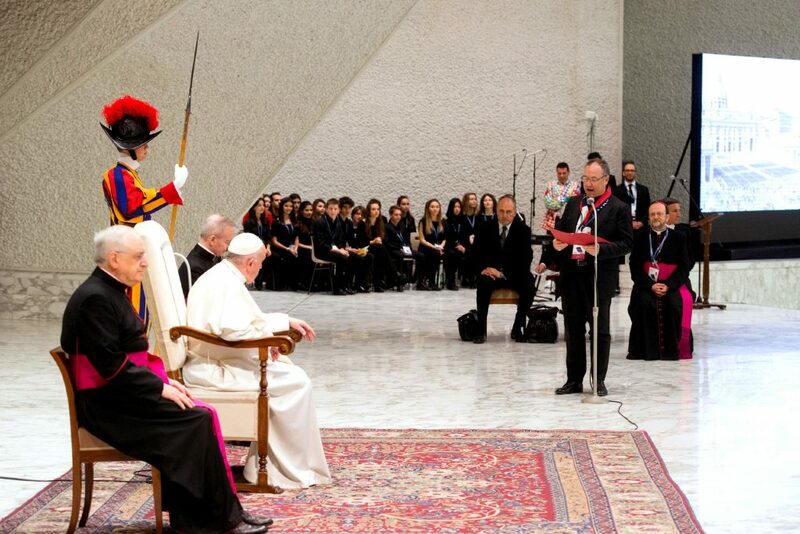 Pope Francis meets with students and staff from Milan’s Istituto San Carlo during an audience at the Vatican on 6 April 2019. Photo: Vatican Media/CNS. “We are the ones who show favouritism,” the Holy Father said. “We are the artisans of the differences” between those who have enough to live and those who don’t. “Why are there so many hungry people in the world?” Pope Francis asked. And, he said, as for children and other innocent people who are killed or maimed in war, that too is a result of human action, “because we, rich Europe and America, sell the weapons that kill children, that kill the people”. Pope Francis’ specific mention of European and American arms sellers was included in the Vatican News coverage of the speech and is clear in the Vatican’s YouTube video of the event but was not included in the transcript of the event released by the Vatican press office on 7 April. 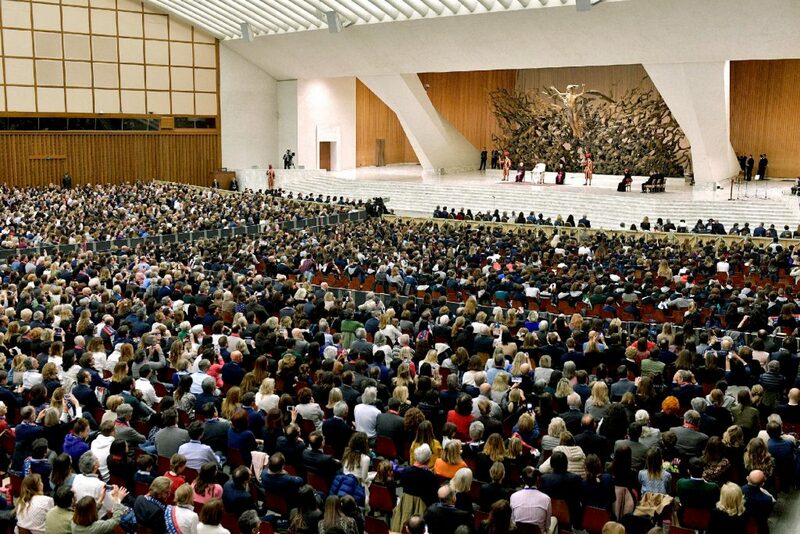 “There are questions for which we will never have answers,” the Holy Father told the young people present. After lamenting how people are closing their hearts and their borders to migrants, Pope Francis also went after the fear-mongers who present migrants as criminals.